This week, Christine Grahame, convenor of the Scottish National Party’s Justice committee, has urged the linkage of the forthcoming Scottish referendum on independence to a referendum on the continuation of monarchy. Her proposal curiously mirrors discussions in the ruling circles of a once-revolutionary England. Early in 1649, the Union of the Crowns forged in 1603 seemed to have gone the way of the King’s head and the crown it had worn. For a brief moment some of the Rumpers thought England and Scotland (though definitely not Ireland) would be free to follow separate paths. Ms Grahame apparently aims at a parallel (though of course peaceful) outcome, but in a different sequence: once Scottish voters have overthrown the Anglo-Scottish Union of 1707, they won’t need the monarchy that once occasioned it. Her proposal certainly highlights the distance travelled since Scots celebrated the Restoration of monarchy in 1660 with extravagant accounts of their line of kings stretching back through the mists to Fergus I. Though that royal myth undergirded national identity, seventeenth-century Scots were as conscious as those of the twenty-first-century that a monarchy domiciled on the distant Thames was no longer the Scottish monarchy James VI and I had taken south. Scots are not alone in reading England’s history as a story of neighbourly neglect or worse. Ms Grahame’s call comes in the same week as the first anniversary of Queen Elizabeth’s historic visit to Dublin. The House of Windsor, like the House of Stuart and the House of Hanover before it, has attended intermittently to its Scottish roots. The heir to the throne has even appeared on TV as Scotland’s weatherman. But the occupants of those royal Houses in the days before 1922 rarely paid much attention to Ireland, and few made Dublin visits. The presentation to Queen Elizabeth II in 2011 of a facsimile of the printed Gaelic primer commissioned by Queen Elizabeth I in 1564 was therefore not just a graceful and fitting gesture. It also reminds us of the hollowness of the Irish kingship that Henry VIII had asserted in 1541. The Irish and the Scots’ experience of the English nation-state in the sixteenth and seventeenth centuries was uncomfortable; perhaps the Welsh only avoided such discomforts by incorporation into that very English state. Not long ago, the rise of the EU seemed to promise new and post-national beginnings, but the EU’s current troubles suggest the excitement was premature. The Queen in Dublin in 2011 spoke affectingly of the twentieth-century Troubles, but the English on the whole still give little thought to the Elizabethan, Cromwellian, and Williamite conquests, or to the significance of 1707. Neighbourliness is going to take some more work. 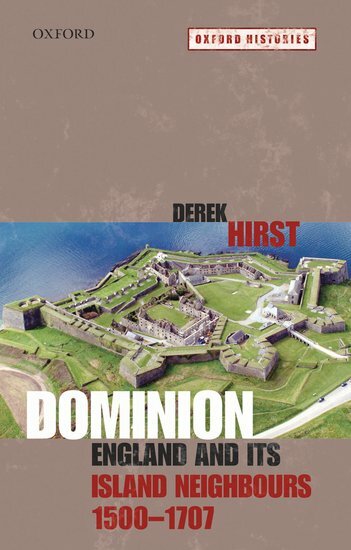 Derek Hirst’s Dominion: England and its Island Neighbours, c.1500-1707 was published by Oxford in March 2012; his (co-authored) Andrew Marvell, Orphan of the Hurricane will be published by Oxford in June 2012. With roots in Huddersfield and an education and early career at Cambridge, he has taught at Washington University in St Louis since 1975.